The PROSPER Delivery System is an evidence-based approach for delivering proven programs for youth and their parents. It is based on over 20 years of rigorous scientific evaluation funded by the National Institutes of Health. What makes the PROSPER approach unique is its focus on building small, strategic local partnerships, and providing them with ongoing support to ensure that they continue to reach families year after year with high quality evidence-based programming. For this project, we will be exploring ways to include representatives from military-serving or support organizations at each level of the state partnership to synergize with existing outreach efforts for National Guard, Reserve, and Active Duty families. Unlike the traditional PROSPER Delivery System which includes both a family-focused and a school-based program, the approach being tested as part of this project will only include a family-focused program. 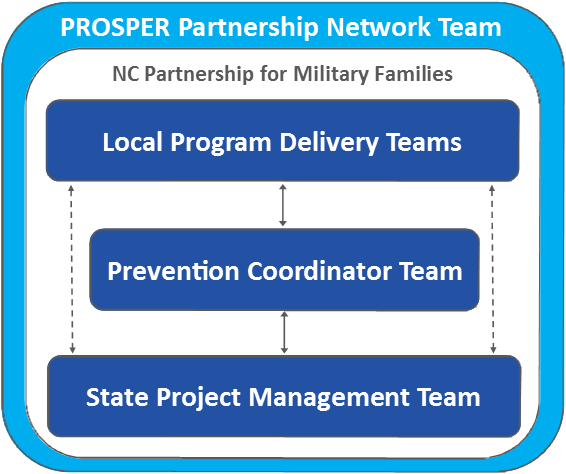 As shown in the Figure to the right, PROSPER Partnership Model infrastructure within a state consists of: (1) Local Program Delivery Teams, (2) a regional technical assistance team called Prevention Coordinators, and (3) a State-level Project Management Team. The Local Program Delivery Team is small, strategic, and focused on planning, coordinating, and delivering the family-focused program, as well as facilitating access to additional resources for any participating families that may need them. The Local Team typically consists of 8 to 10 individuals. Although the exact group composition will vary by site, potential team members include: Family Readiness Group representatives, Cooperative Extension personnel, American Legion Auxiliary representatives, representatives from other youth- and family-serving organizations (military-focused or otherwise), military-connected parents and middle/high school aged youth in the community, interested school personnel, as well as facilitators who lead the family program sessions. Prevention Coordinators provide tailored support to their assigned local team around development, program implementation and quality monitoring, and program sustainability and function as liaisons between the State Project Management Team and Local Teams. The State Project Management Team oversees all aspects of PROSPER Model implementation and provides guidance to and supervision to Prevention Coordinators as they work with Local Teams. These teams are supported by the PROSPER Partnership Network Team at Iowa State University. The PROSPER Approach works by using systematic, proactive technical assistance that provides Local Teams with the tools they need and guidance on how to use them successfully. Local Program Delivery Teams are designed to involve a wide range of stakeholders working for a common cause. Click here to learn more about the original PROSPER Delivery System.